This spring Remington contacted me to find out if I would like to try one of their electric or battery powered lawnmowers. I really wanted to try a battery powered lawn mower, especially since our old lawnmower died earlier this spring. We have too many trees and other obstacles in our yard for a corded electric lawnmower. Because of the battery lawnmower is a little bit heavy, would not work if you have very large hills or steep inclines to mow. Not self-propelled, this is only a drawback if you are used to a self-propelled lawn mower. This was a smaller base compared to our other lawnmower. 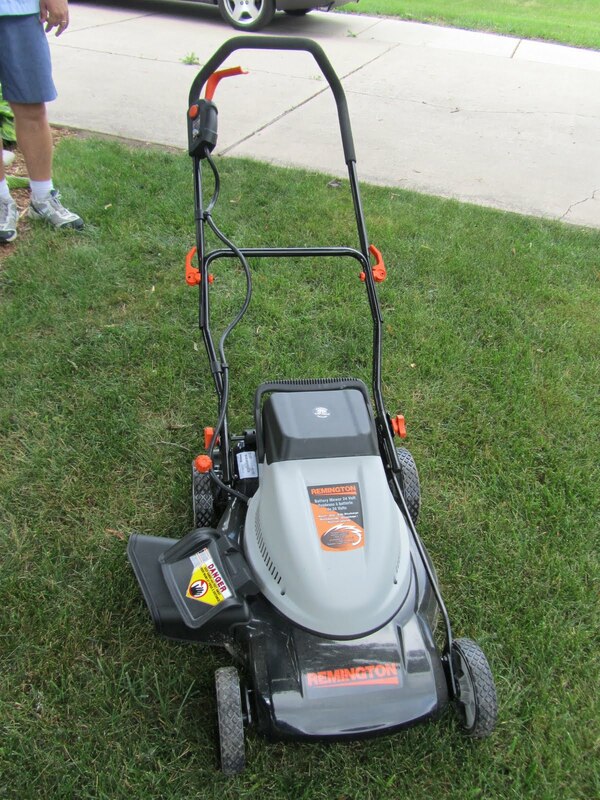 This is 19" and our previous mower was 22"
Would you like to win your own Remington RM212B Electric Battery Push Mower?? Cheesehead Gardening and Remington are giving one away!! Just enter here. A winner will be chosen by random number generator on July 25th. So be sure to enter by 9pm (central) time July 25th. Good Luck! Remington sent me the lawnmower free of charge, but asked me to be 100% honest in my review of their product. I'd love to enter, but I have too many rocks around here:)The thing would be broken in no time....plus it would help if I had grass:) I love the video. It looks like a nice machine. Hope you're enjoying your summer....I know I am. This week I'm housesitting 5 puppies who are all sitting around me right now. Have a good Thursday! Such a cool giveaway and it looks like it would do the trick around here. What a neat lawn mower! It looks like it really worked out for you! would work great on my lawn! What a cool giveaway! Good luck to the entrants! I am using Lawn mower since 2 years, and I think this is really nice way to give shape for our lawn, I would also like to some more reviews on that, visit my blog for more information on Zero Turn Lawn Mower. Mowing your lawn can be immensely tedious, especially after it has rained or it is a hot sunny moment. A zero turn mower is ideal for yards with a lot of obstacles. Visit here for more details coppafeelgarden. Not all weed eaters are made equal. The 18-volt and 20-volt best weed wackers are also typically made for residential usage, but they're excellent for bigger lawns and thicker kinds of grass.